Hearing aids are life-changing health tech devices designed to treat varying degrees of hearing loss simply and effectively. Like any tech device, hearing aid prices can vary, so knowledge of what is available, how much they could cost, and why, is important if you’re considering buying one for yourself or a loved one. Hearing aid devices usually cost between $1,000 and $4,000 for a single unit. Models in the upper end of this price range will offer the most advanced features and promise the highest quality of sound. Nonetheless, the most expensive unit is not necessarily the best fit for you as this will be determined by your degree of hearing loss, personal preferences and lifestyle. *Tech.co can set you up a free hearing test (worth $175) with a local hearing specialist in your area. Simply fill in this form to claim your consultation. While there is now more choice of style and fit than ever, it’s true that hearing aid costs have increased over the past few years. All in all, these incredible listening devices will cost you quite a bit of money. This means it’s especially important to make the right choice for your needs. Hearing aid prices can seem high, but it’s not just the model you’re paying for; you can’t exactly “install” them yourself. Hearing aid costs should be understood not just as the price for a piece of health technology, but as the trade off for a full package of tech and medical support that improves your health and lifestyle. Remember, this small piece of equipment is life-impacting. The total price represents an investment in your quality of life from enjoying the rich sounds of your favorite music, to communicating better with your family and friends. Can Hearing Aids Be Less Expensive? 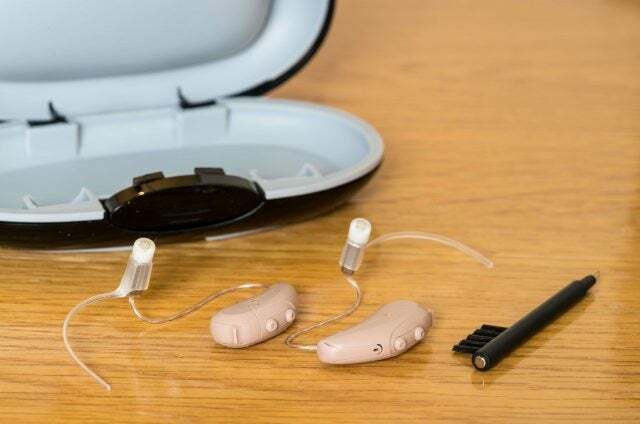 It is still possible to find a cheap hearing aid solution, but if you’re shopping for hearing aid bargains, you’ll need to be careful – the limitations of the cheapest solutions may mean you’re wasting money, instead of spending a little more for a genuine benefit. The best way to keep costs as low as possible is to speak to a professional to understand exactly where each cost is coming from and therefore which expenses are worthwhile for you. This will allow you to unbundle some expenses, choosing only what you want to pay for and potentially bringing down the cost. Hearing aids are also set to be even less expensive over the coming years, with improved technology and plans to make them available over the counter. With the cost of hearing aids being so high, it’s only reasonable that you’d be looking to cut costs when it’s time to buy. While there are a few options that can help you keep the price down, make sure you do your research, as there are a lot of options out there that aren’t designed to treat certain levels of hearing loss. If you’re looking for a cheap way to amplify sound, it is not through a “hearing aid” but through a Personal Sound Amplification Product (PSAP). However, these are not built for those with hearing loss and we do not recommend them. While you might be tempted to buy the cheapest model you can find, beware. Personal sound amplification products (PSAP) can seem like an affordable alternative to an expensive hearing aid. However, these are not designed for the hearing impaired. These devices are designed for those with healthy hearing that simply want to improve it for recreational purposes. It’s important to remember that your hearing is not where you want to cut costs. Yes, the prices can get pretty high, but the difference between a PSAP and a bonafide hearing aid is dramatic, so make sure you have the right device for your needs. With hearings aid prices as expensive as they are, you’d hope that they’d be covered by your health insurance provider. Unfortunately, this is hardly a given, as most providers have a long list of requirements to subsidize the cost of hearing aids, and they rarely cover the full cost, depending on your individual plan. Hearing aids are also not covered by Medicare, although you may qualify for some benefits as a Medicare Advantage Plan member depending on your level of hearing loss. Medicaid, on the other hand, covers a few costs depending on the state you live in, which means you’ll have to look up exactly what you qualify for before you buy. Then there are programs and organisations which offer financial support for the purpose of purchasing hearing aids; such as Scholarship for the Hearing Impaired which is supported by the Traveler’s Protective Association of America and Starkey’s Hear Now program. Veterans are offered a number of benefits, like free consultations, hearing devices, and follow-up appointments as long as they qualify- often focused on service-connected injuries and disabilities. On more than one occasion, hearing aids have been described as tiny, ear-sized digital computers. With that much tech in such a small device, upkeep is incredibly important to making sure your hearing aid lasts the test of time. This shouldn’t cost you much extra day-to-day, but will protect you from future fixing and/or replacement fees. Many healthcare providers will offer hearing aid cleanings free of charge. However, if you don’t have time to stop by the doctor’s office every day to get your hearing aids cleaned, there are a few daily procedures you can go through to keep your device working flawlessly. For one, cleaning your device with a soft, dry cloth can do wonders for the longevity of your hearing aid. Make sure to wipe off any ear wax or dust thoroughly, as they can contribute to the deterioration of the device. Additionally, keeping the device away from moisture is key to making sure your hearing aids last as long as possible. Like any tech problem, catching it as early as possible is the best way to avoid having to replace it. With hearing aids, there are a few obvious problems to be aware of so you can get it fixed as soon as possible. If any one of these problems is presenting itself, set an appointment with your healthcare provider to make sure your device is still in working order. Continuing to use a broken hearing aid is not advised, as it can further damage your ear as well as leaving your hearing loss untreated. Considering how expensive hearing aids can be, getting a warranty is more important than you might realize. Between accidents, drops, and normal wear and tear, these fragile devices are prone to breaking more than you’d think for such an expensive piece of technology. Fortunately, manufacturers typically provide a one-year warranty as part of the product, which protects you from damage, loss, or repairs. Additionally, most specialists will offer you the chance to extend the warranty, a wise decision considering the expected life span of a hearing aid comes in at around six years. Incredibly, the average length of time that goes by before most people treat their hearing loss is 8 years. Don’t let the costs keep you or a loved one from waiting this long- speak to your local audiologist today. All the information we can give you is based on averages and approximations, but they can help you understand how much your personal hearing aid needs will really cost, based on your current health. Plus your local specialist will be able to talk you through all your options for payment plans to help you manage your expenses. Don't waste time wondering whether you should or could afford hearing aids. Speak to your local hearing specialist for answers today.